Uganda is a public sector reform leader in Africa. Over the last three decades the country has introduced many laws, processes and structures that are ‘best in class’ in Africa (and beyond). However, many of the reforms have produced new institutional forms that function poorly and yield limited impacts. 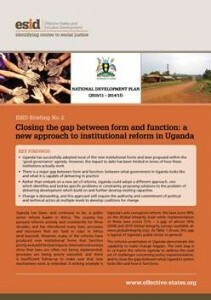 Research by ESID with its partners at Harvard University and in Uganda suggests the next step is to re-frame the reform agenda to address challenges concerning policy implementation, and to close the gaps between what Uganda’s system looks like and how it functions. Uganda has successfully adopted most of the new institutional forms and laws proposed within the ‘good governance’ agenda. However, the impact to date has been limited in terms of how these institutions actually work. There is a major gap between form and function: between what government in Uganda looks like and what it is capable of delivering in practice. Rather than embark on a new set of reforms, Uganda could adopt a different approach, one which builds on and further develops existing capacities. Change is demanding, and this approach will require the authority and commitment of political and technical actors at multiple levels to develop coalitions for change.